I've been wanting to mention this for awhile, but I keep forgetting! 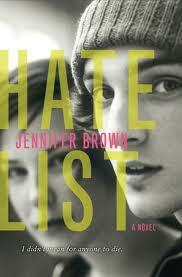 One of my favorite novels from last year, Hate List by Jennifer Brown, is now available in paperback. If you haven't had a chance to read this one yet, I really recommend it. I've been thinking about it lately with the recent attention brought to bullying. It's a very affecting book, and one I think you'll find worth your while. I'm not crazy about the paperback cover but whatevs. At least it's more affordable, right? So read my review from last year and go on and check out the book!